Continuing with the ideas that so evidently interested David O. Russell in his first two films, he moves into his third with an altogether different take on the theory and idea of the Lacanian Big Other, although still retaining it as an important motivator. Three Kings is based on a script written earlier by comedian John Ridley, though if you ask Russell, he’ll claim the script changed dramatically, while if you ask the uncredited Ridley (he’s credited for coming up with the story) the film is almost identical to his script. Whoever is right, the film is a masterful work of combining genre and element to form something new, while at the same time examining the motivation of the individual through the lens of, not only what is motivating them, but what motivates a film maker, and a country at war. Russell again upsets the tropes of genre by choosing not to follow the established patterns of war films, such as the famous dualities honour/brutality, duty/self-interest, cooperation/ individual heroism, sacrifice/ personal tragedy and instead moves this representation onto nations, depicting the dualities within the two countries represented, so that America is seen (by the end of the film) as both aggressor and victim, just as Iraq is viewed in the same light. This removes the usual war film moral judgements from Three Kings, and exposes the film to that rare place where both sides of an aggressively opposed argument feel properly represented within the film. 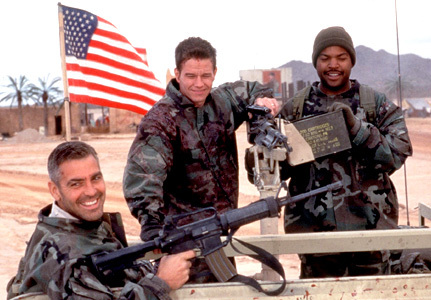 Three Kings opens with the cease fire in the first Gulf war. American’s see an Iraqi soldier waving a white flag, and ask among themselves if they are still allowed to shoot. Deciding they are, they confirm the man waving the flag has a gun, and one of the men, Barlow shoots the man in the neck. When the camera runs, documentary style toward the dying man, Barlow’s compatriots congratulate him on finally making a kill, while Barlow himself, with the camera looking up at him from below, turns away in horror. In this way, Three Kings starts out with a damning critique of the war in Iraq and the American involvement there. In fact, the film is almost redemptive of America’s presence in the Gulf war, even going as far – via the interrogation scene between Barlow(Mark Wahlberg) and Said( Saïd Taghmaoui) – to posit Americans as the moral superiors. During this scene, great pains are taken to draw parallels between Barlow, a young father who joined the army to raise money for his impoverished family and Said who joined for the same reasons. In a rather horrific scene, Barlow is forced to drink oil, which Said claims is the primary motivator for American involvement, and yet the film, by focussing on the individuals, reveals a personal motivation for the Americans, that are strikingly similar to the Iraqi soldiers motivations. However, Barlow might not be there for the oil, but he is in that bunker being tortured because of a desire for gold, and he has not lost his daughter and had his wife mutilated as Said has, neither is the war being fought on his home turf. When Gates bursts in and instantly kills the Iraqis in the room, injures Said and frees Barlow, he offers Barlow the gun to shoot his torturer. The camera stares up at Barlow from below, the same way we watched him when he examined the Iraqi in the opening shots who was killed despite his attempts at surrender. It is Barlow’s decision not to kill Said that implies a learnt morality, however no matter how much Barlow may have suffered up to that point, he hasn’t lost what Said has lost, which by his own confession, accounts for Said’s anger. Three Kings has a lot of this moral confusion with American heroism almost always being represented through the Hollywood lens and the Iraqi morality occurring as a documentary style realism. The duality of war, war films, war journalism and war stories seems imbedded in the very framework, in the fragments of the story, so that not one single narrative comes up clean when examined under the lens of morality. Russell doesn’t preach but he is careful with his filming, keeping shots of Iraqi’s face to face while Americans are constantly bathed in Hollywood style arrivals, exits, playful dramas and deep engaging character studies. 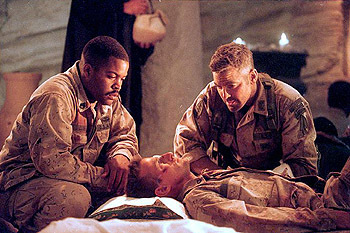 The end of Three Kings even details what became of the protagonists almost forgetting the film is fictional. 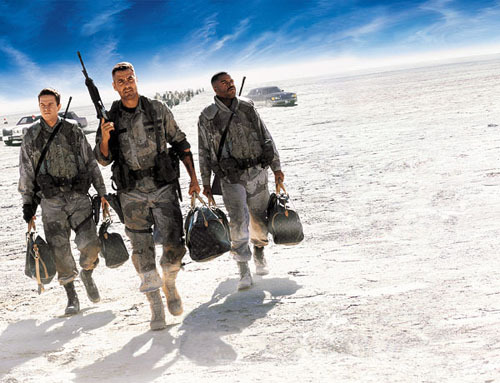 In this way, Three Kings is as much a critique of American war films as it is of the Gulf war itself, and by creating this self-conscious narrative, the film engages in the two-way creative process of the American soldier conducted by both Hollywood and The Pentagon. Some of the best scenes in the film happen when outbreak of violence occur around the American soldiers that they did not cause and that they have no part of. Again, these scenes speak to the broader political climate, where America stands in the midst of conflict and does nothing, and again, involvment is reinforced by Russell with his representation of American action being a moral choice to care for a group of people when they cry for help. If Three Kings is not a plea to deny war, then it is definitely a plea to understand that war is complex that heroes are made from moral responses to their experience and intimate knowledge of the people in the country they inhabit is essential for any sort of justice to exist. In the end, the three kings who bring gold as a gift to the new-born Christ, will give the gold they came to steal in exchange for the lives of Iraqi’s who have fought against Saddam and will forfeit their lives as a consequence. Three Kings is a film, the first for Russell funded by Hollywood, that has a bet both ways, and it can be (I suggest successfully) argued that this is due to the subject matter and a desire not to offend anyone in its narrative. While overturning some genre tropes, it maintains the most important ones of American moral superiority and the hero’s journey, while making the claim that not all Iraqis are bad and American indiscriminate bombing caused some damage. As if to nail this perspective home, it is worth noting that the film, the first ‘big budget’ film by an Indie darling, was released on the first of October 1999, just in time for the awards season. If Russell intended originally to make an anti-war film, the Big Other of Hollywood has seen to it that it didn’t materialise.